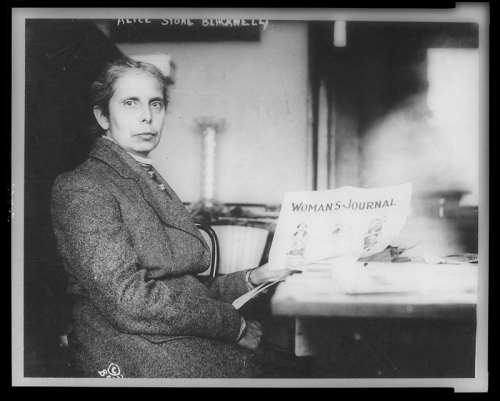 Alice Stone Blackwell was the only child of Lucy Stone and Henry Blackwell, both abolitionists and women’s rights activists. She was well-known for her work as the editor of The Woman’s Journal (1881–1917)—the official magazine of the American Woman Suffrage Association (AWSA)—and she initiated a reconciliation between two competing factions of the suffrage movement, which merged into the National American Woman Suffrage Association (NAWSA). In 1893, through a family friend, Blackwell became interested in the “Armenian Question,” which led to a passionate engagement with the plight of oppressed peoples around the world. Her sensitive translations of poetry—including Armenian Poems (1896), Songs of Russia (1906), and Songs of Grief and Gladness (1907; from Yiddish)—are a testament to this commitment. In 1930, she published a biography of her mother, Lucy Stone: Pioneer of Woman’s Rights. Unknown artist. Alice Stone Blackwell, between 1905 and 1917. Library of Congress, Prints and Photographs Division, Washington, D.C.